The Census Bureau recently released U.S. population projections for 2012-2060. 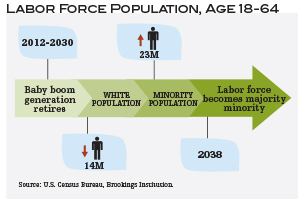 William Frey, a demographer at The Brookings Institution, a nonprofit research company, spoke to Talent Management to discuss the implications of the U.S. becoming majority minority — when the white population becomes less than 50 percent of the total — earlier than previously estimated. Frey says it’s vital to remain focused on the younger generation, who will change the face of the future workforce and impact the way companies train talent. How are the new U.S. population projections for 2012-2060 different from past numbers? The data shows the population is going to be growing a lot slower. Over the next 50 years the population will only be growing about half the rate that it has been growing the previous 50 years, and it will continue to get slower and slower as we get further into the future. The last decade we grew almost 10 percent as a nation. By the years 2050-2060, we will only be growing about 5 percent over that decade. There are two groups that are going to be growing much more rapidly. One is going to be the minorities, especially Hispanics and Asians. The other group will be seniors, which will be primarily white. But the senior group is growing not because they’re moving to the United States, but because these people are passing that 65 and over age group. What does this new data imply for future generations? The school-age population will become majority minority in the year 2020, according to these latest projections. We are already showing, year by year, absolute declines in the white child population, and that’s simply because the white population is getting older, there are fewer women, and there are fewer women who are white and of child-bearing ages. White fertility is going down; there are actually more white people moving over age 18 than there are children born. 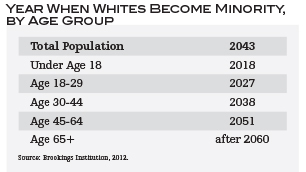 As a result, the only way we’re gaining population for the younger part of our age structure is because of minorities. Some of this is due to fertility of minorities who already reside in the United States. Some of this shift is from children of new immigrants, but it’s largely because we’ve had a large amount of immigration over the last 20 years. Why are fewer white people immigrating to the United States? I think it has a lot to do with our immigration policy, which goes back to 1965. We switched from a system that favored the countries of Europe and largely having bigger quotas for Northern, Western and Southern Europe, which are largely white populations. Post-1965 it kind of opened up to the rest of the world. As an addendum to that, many immigrants come into the country due to a part of immigration policy called family reunification. The policy says that an immigrant can bring his or her children and spouse and other relatives to the United States. Once we had more people coming in from Latin America, they later began bringing in their relatives. We do still have people coming in from Europe, but it’s just a much smaller percentage than it used to be. What would you say about the idea of the American Dream — is it over? I think that people from many different backgrounds are now embracing the American Dream. I don’t think the American Dream is relegated to just one ethnic or racial group. I think we’re really making a big change in the United States. The last decade, after the 2010 Census, I see as a pivot decade for the United States. We are moving from a country that has been largely white, older baby boomers dominating what was going on, to one that is multi-ethnic and multi-racial and globalized. At the same time, young families are coming here. Their children will not be minorities. They’re going to have the same aspirations that Americans have always had. The dream is the same, it’s just that the people are different. Will minority shifts affect major industries in the U.S.? I have calculated that between now and 2030, there will be a decline of 14 million whites who are moving out of the labor force. But there will be a gain of 23 million minorities, in which 15 million will be Hispanics. One thing we know already is that a lot of immigrants that have come in over the last 20 years, especially from parts of Latin America, haven’t had the same levels of education as middle-class Americans do, or did. That puts even more pressure on making sure that their children are getting the right kind of movement into the middle class. That’s a long way of saying that it’s important we pay attention to these kids, especially the second generation of immigrants, whose parents may not have had the kind of education and background that would put them in the middle class. We want to make sure their kids are getting into the middle class. It’s extremely important that these kids get training — either from public schools, public educations or from private companies — to make sure these children have a way to communicate and a pathway. To me, that’s a crucial part of what these demographics show. If we’re going to replace the large baby boomer cohort that will leave at one end of the labor force with new people coming in, this is really an investment in the future we’re going to have to make. What should companies do now to prepare for their future workforce? There are lots of different strategies that are being proposed. One is just making sure the public schools are better. Others are trying to create partnerships with high schools to make sure that high- or low-skill technical training is available. This is to ensure that young people graduating from these programs are ready to hit the ground running when they move into companies. However, these are the kind of partnerships that are going to be the challenge for the next decade or two, making sure there really is a pathway for all these young people to get into the labor force. As the projections show, the younger part of the population isn’t growing nearly as fast as the older part of the population, so these are really valuable people, these young people. We need to pay a lot of attention to them. Jennifer Kahn is a former editorial intern at Talent Management magazine. She can be reached at editor@talentmgt.com.